Following on from yesterday’s post. The Parish Council are extremely excited about the new facility and we look forward to seeing the room used for a multitude of village activities. The Parish Council is pleased to announce that it is now controlling the hire of the Spaldwick Community Room. The room will be available from 8am to 11pm 7 days a week. Interest is being sought as to whether there are any interested parties for allotments with water and parking within Spaldwick? We are currently at the enquiry stage, but would you or anyone from within the village be interested? I hope that the strong winds arent affecting you too badly and that you are keeping warm and well this winter. There has been an incident in Soham which I wanted to highlight to everyone. An elderly gentleman was phoned by someone claiming to be his bank. They knew personal details (full name, date of birth and address) and claimed that he had been overpaying a charge. They claimed to have a cheque for him and said that they would like to bring it round so that he could pay it in. Fortunately the gentleman recognised it as a scam, but it is something to watch out for. His family think that the plan was to take him to the bank, which is quite possible; it is also plausible that they wanted access to his home. Either way, it is very suspicious and whatever their intentions were, I doubt that they were good or in the residents best interest. On a lighter note there are some events that Id like to let you know about. Power2Inspire invite you to go along to Huntingdon, March or Ely to try simple, fun, accessible games. Try a different sport, suitable for young, old, disabled or not each week for gentle exercise. Ive attached the information in case you would like to join in. It looks like fun. If you have any neighbours who have found themselves housebound, either due to the winter weather or for any other reason please let them know about The Library at Home Service. The library has lots of volunteers willing to pick up books for their neighbours during their own visit to the library. They will collect them and bring more every month and the visitor and the reader are matched so that the readers always have the same person – who often becomes a friend too. The colder weather often keeps elderly or less mobile residents at home and a book can be very welcome! We are equally, always looking for volunteers so if you or anyone you know has an hour a month to spare for a housebound neighbour wed love to hear from you. For more information about The Library At Home Service please contact volunteers@cambridgeshire.gov.uk. The Parish Council are waiting for the Local Education Authority (LEA) to provide them and their solicitor with a lease. Once this has been agreed and signed then the Parish Council will be responsible for the rental and maintenance of the room. Until the lease is signed the school is still responsible for the rental of the community room. So, if you want to rent the room contact the school for details. If you would like more information please feel free to contact the LEA. I am pleased to announce that the Spaldwick Community Room will be undergoing some refurbishment over the summer. As a part of this the format and access to the room is being adjusted so that the community room will be available for use during the school day. More details to follow about this exciting project to follow. Booking of the community room from the 1st September 2017 will be carried out via this website. Did you know that Spaldwick has a No Cold Calling Zone (NCCZ) in Royston Avenue? A joint effort between Cambridgeshire County Council Protection Team and Spaldwick Parish Council intends to extend this initiative to the whole village under the title of Spaldwick Good Neighbours Scheme. The original scheme was set up to discourage cold callers and to give residents the confidence to say ‘no’ to uninvited sales people – helping to prevent people falling victim to distraction burglars and rogue traders. Whilst the zones were originally introduced by Cambridgeshire Trading Standards, it is recognised that community-led action is much more effective in protecting local people from unscrupulous tradespeople. Indeed, the best prevention and support for residents comes from within their own community. 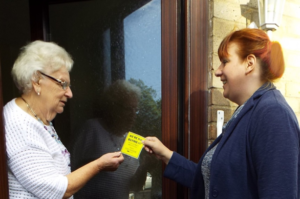 Spaldwick Good Neighbours Scheme will be able to offer a range of materials for residents including door stickers, advice on how to spot a rogue trader and tips to prevent unwanted mail and phone calls and to spot IT scams. It is the intention to expand it to achieve so much more. For example residents can support their neighbours by putting bins in and out for the more infirm or during holiday periods, collecting prescriptions for those in poor health or without vehicle access, organising events to increase social cohesion, joining the Library at Home service to support housebound readers and creating book and jigsaw exchange schemes. Keeping an eye out for your neighbour can make all the difference, reduce isolation to those alone and build strong communities. Mike Robinson Vice Chairman of Spaldwick Parish Council has agreed to be the lead and local co-ordinator in setting up this scheme. If you would like more information, need any advice or can help with the scheme in any way we would welcome your support. For more information please contact Mike Robinson Vice Chairman of Spaldwick Parish Council at 27 Thrapston Road Spaldwick or telephone 01480 891931 or if not available Stephen Fane De Salis Chairman of Spaldwick Parish Council on 07736444765. We are currently undergoing a large-scale round rescheduling project which will result in most residents across the district experiencing date changes to their refuse and recycling collections. The implementation date of the new rounds is 27 February 2017.
the work force as well as being more efficient in terms of time and fuel. still finalising a few of the collection rounds so I am unable to provide you with the new arrangements for your parishes/towns at the moment. centres. The aim is obviously to spread the message and reach as many residents as possible. I have also attached an electronic copy of these and if you are able to upload on to your website or social media site that would be greatly appreciated. By carefully analysing its current collections rounds the council has been able to work out more efficient and effective ways to collect residents’ refuse and recycling. When will the changes be happening? We will be making changes from 27 February 2017. We are still working on the final routes. Once we know how the changes will affect an individual household the new collection days will be updated on our web calendar. In addition we will be writing to households letting them know about the changes. Will my day of collection change? It is likely that collection days may change for some or all of your bins. Will my time of collection change? We do not provide a time of collection for your bins as issues such as traffic jams, roadworks or breakdowns can affect our collection time. You should ensure your bins are out for collection by 6.30am. If you bin is not out for 6.30am and we miss it because we have collected at a different time from normal we will not return to collect it before your next scheduled collection day. I have an assisted collection, will it affect me? The assisted collection service will remain in place and continue as normal; however this may be collected on a different day but we will notify you if this is the case? Please ensure we can get access to your property to collect your bins on your new collection days. What information will you be sending me? 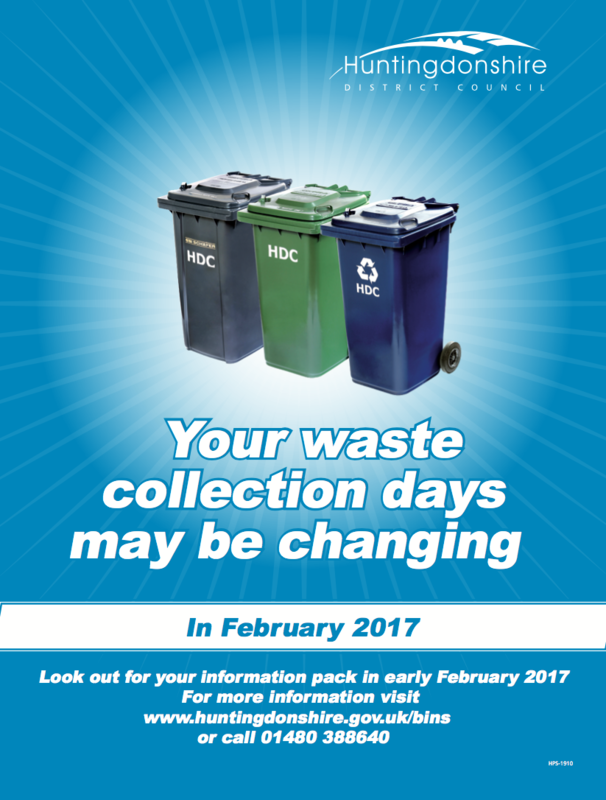 In early February you will receive a pack with a letter detailing your new collection days and a Recycling and Refuse Guide which provides an up to list of what materials can be put into each bin. What if the changes do not affect me – will I still receive a letter? A letter will be sent to all households and our trade customers to provide up to date information on our services. What should I do if I haven’t received a letter? If you haven’t received a letter by 17 February 2017, then please contact us by email on mail@huntingdonshire.gov.uk or by telephoning 01480 388640. Please make sure you give us your full name and address of your property and the types of receptacle you have. When will you be updating your collection calendar? As soon as the routes are finalised we will be updating our online collection calendar. The information should be available in early February. Your collection calendar is available at www.huntingdonshire.gov.uk/bins. Further information will be available on www.huntingdonshire.gov.uk/bins or by telephoning 01480 388640. Please do not call us before 6 February 2017 regarding changes to your day of collection as specific information on collection days will not be available until then. During Easter, May Bank Holiday, Spring Bank Holiday and the August Bank Holiday there will be no changes to your scheduled day of collection as our crews will be collecting on Banks Holidays.